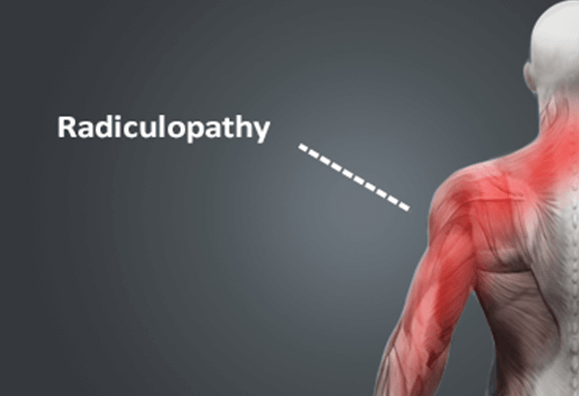 Radiculopathy is when one or more nerves do not work properly as a result of certain medical conditions where the nerve becomes pinched. Injury results at the root of the nerve (where it exits from the spinal cord). The pain often radiates to a part of the body associated with the nerve. For example, a pinched nerve in the neck can cause weakness and pain in the arm and a pinched nerve in the lumbar-sacral spine can manifest symptoms in the legs. Diagnosis is made through history and assessment, physical examination, MRI, Nerve Conduction Studies and Electromyogram. Treatment generally starts conservatively with physical therapy and chiropractic manipulation as part of a rehabilitation to strengthen muscles. Although a conservative approach is preferred, some patients do not improve and may need surgery such as laminotomy or discectomy. Staying active – staying active helps keep you moving. Too much rest can worsen symptoms. The doctor should be contacted if pain worsens, you develop depression, pain lasts for more than 1 – 3 weeks, new signs of pain and numbness in the extremities and groin/genital area, and bowel and bladder problems develop. As a result of patient rights, you have the right to help plan the appropriate treatment. Research and know as much as possible about the illness and its treatment to discuss with your doctor.